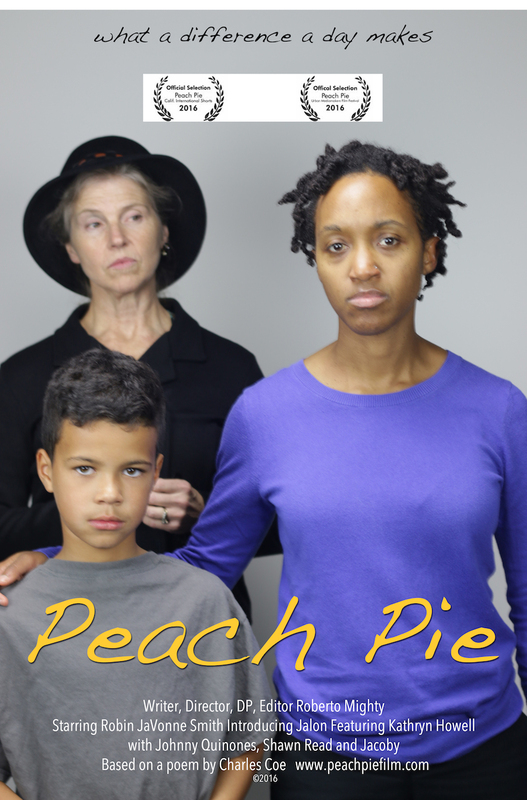 Peach Pie debuted to a rave review at the California International Shorts Festival in June, 2016. Peach Pie follows one afternoon in the life of a 7-year old boy and his mother, whose untreated OCD is affecting their lives. Still in mourning after their soldier Father/Husband is killed in action, they struggle to cope day-to-day. An intervention by a well meaning neighbor - who may have a hidden agenda - leads to an emotional moment. Roberto Mighty was Director, Screenwriter, Cinematographer and Editor. The story is based on a short poem by acclaimed author Charles Coe. Starring Robin JaVonne Smith; Introducing Jalon; Featuring Kathryn Howell; with Johnny Quinones, Shawn Read and Jacoby. Peach Pie's principal locations are in Boston's Fort Point Channel arts district, with additional scenes filmed in Cambridge, MA.